Household-based micro-irrigation systems can encourage smallholder farmers to start small businesses based on water lifting technologies. In many parts of Africa, smallholder farmers use motor pumps, hand pumps, treadle pumps, rope and washer pumps and pulley systems to irrigate their farms. In Ethiopia, motor water pumps are used commonly. But they have higher operational costs including for fuel, oil, labour and maintenance. Solar water lifting pumps are a promising alternative that could lower costs for farmers because they have relatively lower operational costs in addition to contributing fewer carbon emissions and pollution, which makes smallholder farming more resilient to shifting rainfall patterns caused by climate change. Additionally, pumps powered by solar energy are far more efficient than an equivalent AC powered pump and are cost-effective and reliable for livestock watering, irrigation, and domestic uses. Solar water pumps may be especially useful in small-scale or community-based irrigation as large-scale irrigation requires large volumes of water that require a large solar photovoltaic array. 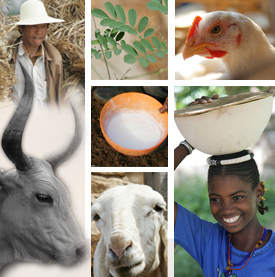 Although these technologies are available and used across the world, the awareness and skills of Ethiopian smallholder farmers on these technologies is very low. 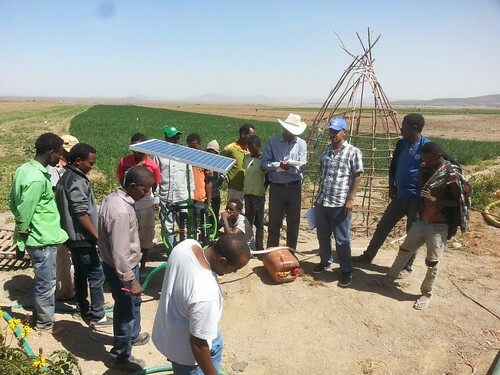 The Livestock and Irrigation Value chains for Ethiopian Smallholders (LIVES) project in collaboration with the International Water Management Institute (IWMI) has commenced the demonstration of solar water pumps with pilot households in Oromia and the Southern Nations, Nationalities and Peoples’ (SNNP) regions. Solar pump demonstration at Bekele Girisa peasant association of Dugda District, East Shoa zone ( Photo Credit: ILRI\ Amenti Chali). Four solar water pumps were purchased by the project from India for 2,600USD (excluding transportation and other related costs) each of which discharges 0.5 litres of water per second from shallow wells with a maximum depth of seven metres. One solar water pump has the capacity to fully irrigate vegetables on 0.2 hectares of land. 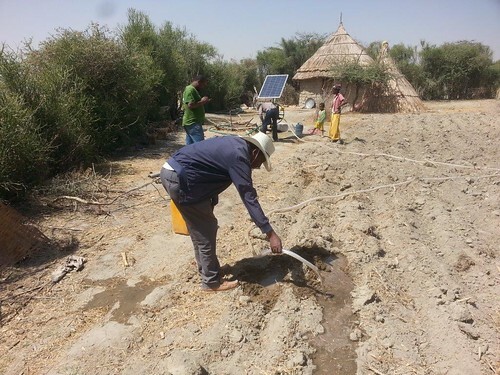 In early December 2015, the solar water pumps were installed and demonstrated for selected households in Gamo Gofa and East Shoa Zones of the SNNP and Oromia regions respectively. The households, which were selected based on their access to shallow groundwater, interest in adopting the technology and previous experiences in household-based micro-irrigation, were briefed on the proper operation and minor maintenance services of the solar water pumps. A business model will be developed by the end of the piloting test to demonstrate to policymakers the benefits of wider use of solar water pumps in the country. In addition, the system of irrigation water distribution and application to crops will be tested by using the drip kits and furrow methods. 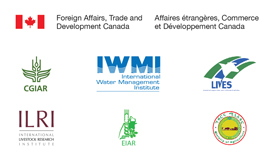 Tags: IWMI, LIVES, Oromia, SNNPR, Solar water pumps. Bookmark the permalink. I am really excited to see the solar pumps working, from different perspective, like consumption of fuel, climate effect, cost of motor pumps etc. Though from what i observed in most of farmers from Mojo to Ziway, Butajira, Foggera, Dangila…the one using motor pumps, it is difficult to show them the benefit of using it. As the motor pump discharge is higher than the solar pump. Even though, discharge is lesser, it can be more reliable to small scale farmers that were using rope and washer pump. As it is more energy consuming and when the washer is clogged into the line, farmers will face difficulty in maintaining it. A small reservoir can be built for the solar pump, therefore farmers can irrigate when they have to use. Thanks for your comments. This is what we have to push forward to help our farmers and promote such environmentally friendly water lifting devices. In addition, this solar pumps can be used to charge mobile phones, hence, farmers in rural areas can be benefited more from it. Very interesting to read about these pumps! Its time for us to reap from the abandant solar resource we have- solar energy! It would be interesting to assess the perception of the parthner organizazions and farmers (indivitudal or unions) on this new innovation. Facilitating situations or emerging challenges with regard to the technology it self or the natural and social environment and measures that LIVES and partners are taking would be good lessond and helpful for developing the business model later on. Thank you Fanos for your comment, currently we are testing the performance of these pumps at two farmers field. we involved our partners at this stage and surely we will collect the perception of farmers as well as partners. WOW it is surprising technology for our farmers to transform our agriculture to industry. It’s nice that the people are becoming aware of the benefits of solar energy and installing them for their use. With solar pumps, the work for farmers has become very easy and they can increase their productions. Share such informative articles in future.